M1A action in a Rogue stock, Nightforce 5.5-22x scope, L3 MRDS backup optic. Shorter version without the scope. This entry was posted in rifle and tagged 308Win, bullpup, M1A. Bookmark the permalink. Looks heavy in that first photo. Weight? The only problem with bullpups is that I shoot lefty, so that means that ejected cases would pop me in the face. 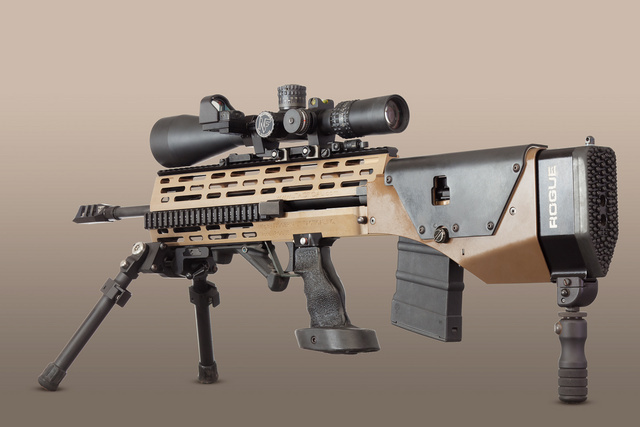 Having shot two different guns with this conversion I plan on restocking my M1a NM with this. I’ve been shooting an M14/M1a since I was first issued one a lifetime ago. I don’t remember the weight but can tell you it does handle easier than a conventional stocked rifle. The balance is centered to the body so any difference in weight is negated by this. It makes the rifle more steady in any position even prone. Also the balance makes it much faster to put on target and transition to movers or multiples. I also think when I get my rifle restocked it will improve my groups. It will certainly make it easier for me to use. I think the compensator is from Rogue as well. It adds about 2 pounds above a standard stock but changes the balance and maneuverability. Sight over bore distance is pretty radical. I don’t know if it would make a good trap shooting rifle, but I’d be willing to try it.